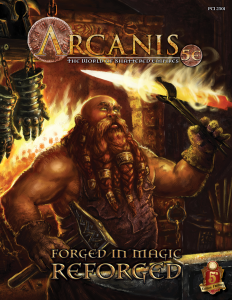 Forged in Magic: REFORGED Funded! A big THANK YOU and congratulations to all 797 backers! With your help and support, FORGED IN MAGIC: REFORGED will be published as a 200+ page, full color hard back! Additionally, we unlocked six (6) Lair adventures. Again, thank you all very much for your support and trust. We certainly weren’t expecting to reach and interest so many of you, but we’re really glad we did!